In this two-day workshop theoretical presentations will be followed by demonstrations and exercises designed to help participants explore the topics covered and then to discuss their experiences. In this talk, Doris Brothers describes her personal journey that began with her realization that her therapeutic work needed an embodied perspective and led to her embrace of Jon Sletvold’s theory. In Jon’s talk he describes how Doris Brothers’ trauma-centered approach and broadened perspective on the effects of politics, history and culture for the clinical encounter has affected his work. Political developments in both USA and Europa have revived the importance of Reich´s analysis of the mass psychology of fascism. Fascist experience as the embodiment of us and them is explored and discussed. The possibility that not only trauma but also dissociation can be best understood as embodied experience is explored. Why is the body dangerous and frightening? The reasons that embodiment has only recently assumed prominence in psychoanalysis are discussed. Why embodiment serves as a good alternative to a concept-based psychoanalysis is examined. The strength and limitations of the character analytic supervision model is examined. Broadening the relational field and adding the perspective and input of the supervisor(s) in embodied supervision. Doris Brothers, Ph.D. is a co-founder and faculty member of the Training and Research in Intersubjective Self Psychology Foundation (TRISP). She was co-editor with Roger Frie of Psychoanalysis, Self and Context from 2015-2019 and chief editor of eForum, the online magazine of the International Association of Psychoanalytic Self Psychology (IAPSP). She serves on the executive board, advisory board and council of IAPSP. Her books include: Toward a Psychology of Uncertainty: Trauma-Centered Psychoanalysis (2008), Falling Backwards: An Exploration of Trust and Self-Experience (1995), with Richard Ulman, The Shattered Self: A Psychoanalytic Study of Trauma (1988). A book with Koichi Togashi, Psychoanalytic Narratives for a Traumatized World is forthcoming. She is in private practice in Manhattan, New York, USA. Jon Sletvold, Psy.D., is a licensed specialist in clinical psychology and psychotherapy. He is founding board director and faculty member at the Norwegian Character Analytic Institute. He has taught embodied perspectives on psychoanalysis and psychotherapy with Doris Brothers in USA, Ireland, China and Cuba. He has published articles particularly on the role of the body in psychotherapy and psychoanalysis in national and international journals. 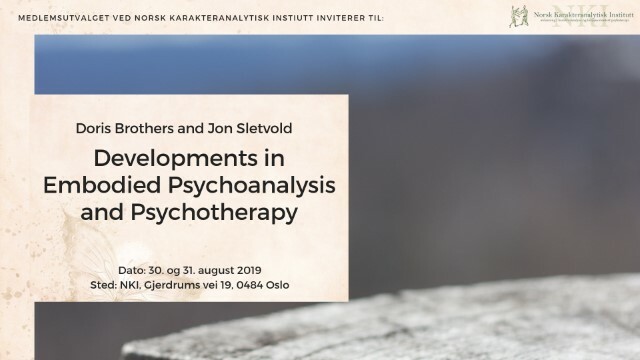 He is co-editor with Marianne Børstad of two books: Den terapeutiske dansen [The therapeutic dance] and Karakteranalytiske dialoger [Character analytic dialogues] and the editor of Tage Philipson – Kjærlighet og identifisering [Tage Philipson – Love and Identification]. He is the author of The Embodied Analyst: From Freud and Reich to Relationality, 2014, winner of the National Association for the Advancement of Psychoanalysis 2015 Gradiva Award for outstanding contribution to psychoanalysis. 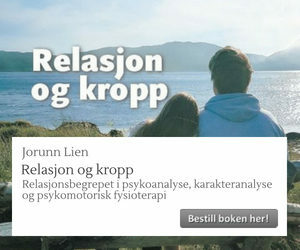 Jeg ønsker med dette å melde meg på "Developments in Embodied Psychoanalysis and Psychotherapy" workshop. Registrering før 01.07.2019 blir fakturert med 'Early bird' pris på 2 800 kroner. Senere registrering faktureres med 3 500 kroner. Du vil du motta en bekreftelse på epost i løpet av de neste dagene. Merk at påmelding skjer fortløpende og at det er begrenset plass på denne workshopen.